Before, during and after your reading I work with the angels to intuit what you need to know to move forward in your life for your highest good. 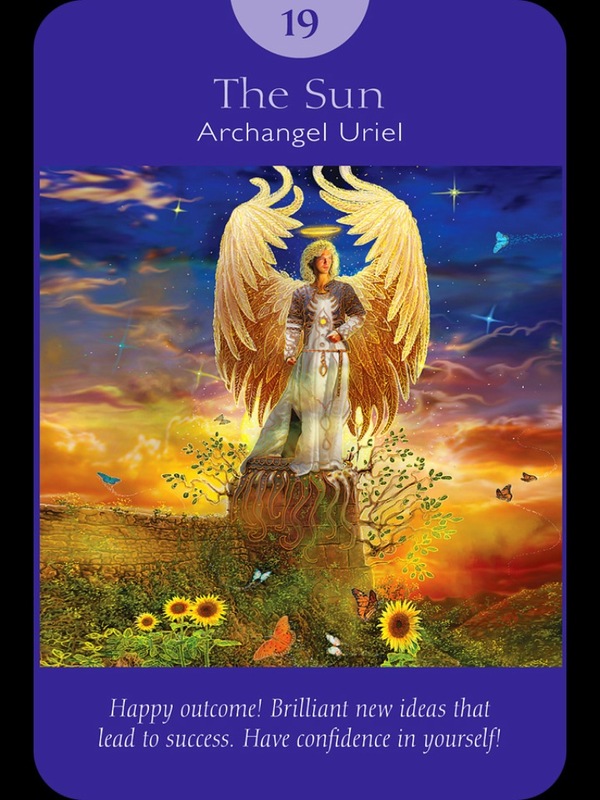 An Angel Reading is similar to a psychic reading, but instead of using traditional tarot cards, I use Angel Oracle cards or Angel Tarot cards and I intentionally ONLY bring in messages from the angelic realm. The angels often highlight things you may need to work on or heal for your highest good and will often gently encourage you to move in a different direction if you’re headed down the “wrong” path. They’ll also cheer you on if you’re on track! The angels are here to help you with love and kindness, but remember, you are always in charge of your life! Because I’m an Intuitive Life Coach and also have a Master’s degree in Spiritual Psychology, I take a spiritual counseling approach to my readings. I find this to be much more valuable to my clients than just “predicting the future.” Yes, we all want to know the future, and if it comes through in the reading I will definitely tell you, but remember: the future is always changing and we’re constantly co-creating it with our thoughts, actions, and choices in every moment. Therefore, with the help of the angels, I’ll intuit what you can do (or how you can be) in this moment to make your life the best and most enjoyable for you. What type of guidance can I give you? I specialize in relationships, career, life path, and spiritual enlightenment, but if there’s something else you need to know, it will come through. The angels won’t hold back information that needs to get to you. They will often NOT give you information too. They’re funny that way. They love surprises!! Then again, who doesn’t? Sometimes just an Angel Reading isn’t enough. It’s great to get quick guidance and answers to your questions, but I find that most clients want more. So with the assistance of the angels, I’ll counsel/coach you on whatever topic is coming forward for you. We’ll come up with action steps for you to take so that you can move forward on your life path with confidence! Please note: I begin working with you 15 minutes prior to our scheduled appointment. It’s best for you to also get quiet and mediate for those 15 minutes in order to align yourself with the healing energy of the angels, but not required. Also, I continue to work with you for 15 minutes after your reading. Sometimes messages will come through for you and I’ll follow-up with you by email. In my experience, past clients have reported that the angels continue to heal and work with them for days and even weeks after their session, causing miraculous shifts in their lives. How cool is that? Love those angels! NEW! 6 Month Angel Intuitive Packages!!! In order to support you more fully, I’m excited to announce that I’m now offering 6 Month Angel Intuitive Packages! I would like to invite you into a six month container where the Angels and I hold you in a loving, supportive, long-term embrace. After working with many of you on a regular basis, I’ve found that consistency serves to deepen your experience by building on the guidance that comes through each session. The entire six months, you will feel the supportive energy from myself and the Angels as we hold a loving space for you on your journey. If your heart squeals with joy over this (or if it just gives you a little knowing smile) please contact me and I will be in touch to schedule your sessions! You can choose either once or twice a month for six months. Sessions are 60 minutes and can be done over the phone or Skype. Contact me to purchase and schedule your session! I can give them via Skype or phone. Both work great!